The Zacuto EVF Pro Electronic Viewfinder (EVF) is a 3.2” high resolution monitor to be used in conjunction with any Z-Finder model. The EVF is compatible with all cameras that have an HDMI output. The EVF allows you to operate with your camera “in-line” with your rod system and an offset viewfinder in front of your eye. The EVF enhances the stability of any set up, gives you better resolution and focus ability, allows you to get your eye where it most comfortably needs to be, enables low mode shooting, and shortens a shoulder mounted camera package. With an external viewfinder, you’re no longer trapped behind the back of your camera. You can have your camera on a dolly or crane or in a car or anywhere and have the EVF in your hand. A Z-finder is a magnifier and as such, do not allow sunlight to enter the Z-Finder, for even a moment, while it is attached to the EVF. The light can be magnified by the lens and potentially cause damage to the EVF screen. Always use the included Sun Mask and immediately put lens cap over lens when not in use. 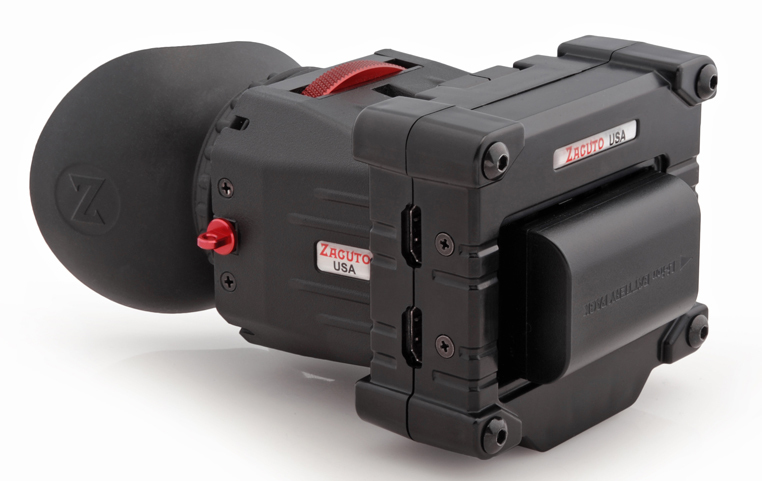 Rent the Zacuto EVF Pro Electronic Viewfinder from Deck Hand Camera Rentals Today!